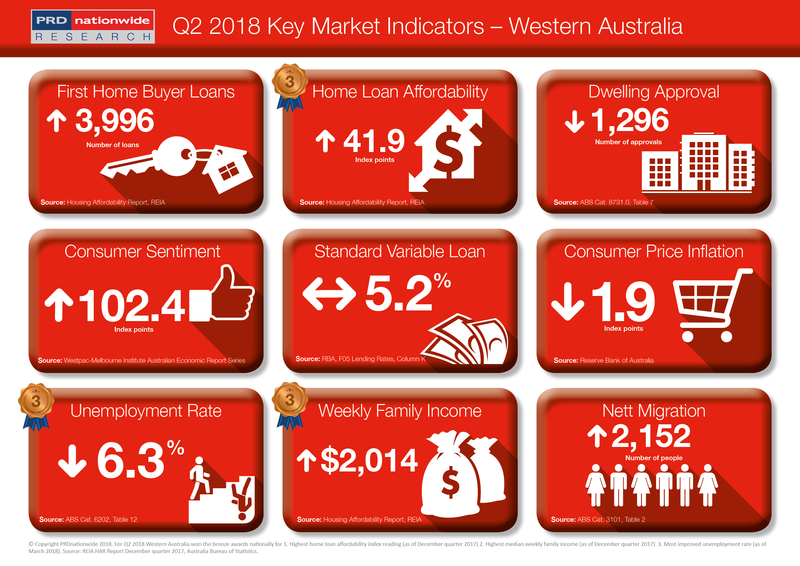 Western Australia achieved 3 bronze awards nationally in PRDnationwide’s Q2 2018 Key Market Data Indicator Awards. For the second quarter running, WA earned the bronze awards nationally for both the highest home loan affordability index reading and highest median weekly family income in PRDnationwide’s Q2 2018 Key Market Indicator Awards. As of December 2017, WA’s home loan affordability index reading was 41.9 index points, well above the Australian average of 31.6 index points. That said, this is a slight decline when compared to the September quarter of 2017 where WA recorded a home loan affordability index reading of 44.6 points. Potentially this can be explained by the mild increase in WA’s property prices, particularly in Perth. State-wide, the economic landscape is still going through a transition period from a mining reliant economy to a more diversified one which includes professional services, tourism, and education. Although the unemployment rate declined by -8.7% over the past 12 months to March 2018, WA earned the bronze award nationally for the most improved unemployment rate. Interestingly, this is actually a step back when compared to last quarter where WA earned the silver award nationally due to the unemployment rate declining by -10.9% over the 12 months to January 2018. That said, there is still good news for WA as it again won the bronze award nationally for the highest median weekly family income, which increased from $2,007 in the September quarter of 2017 to $2,014 in the December quarter of 2017.